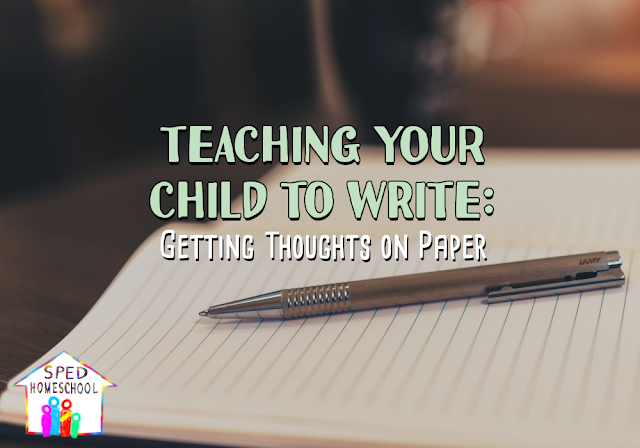 Once you have worked on sizing, alignment, and spacing, it is time to help your child put their thoughts together into sentences and paragraphs. For me, this is the exciting part! Teaching a child that they can use their imagination, think of anything they want, and then communicate that to others is almost magical. There are a couple different ways to help them do this. Journaling is a great way to start. Having a notebook that they write in a few times a week is a low stress way to start learning to write longer concepts. When your children begin journaling, they can write just a single sentence about something they have done, something they have learned, something they want to do, or a place they have visited. You can even have them answer a question about themselves every day if they need somewhere to start. We often learn best by doing, so journaling is also a great way to work on spelling, grammar, and vocabulary. You can also have writing prompts that focus on spelling or vocabulary words you are currently working on. Learning concepts as they write will help them to be able to do it in the future. Having a pen pal or writing a cousin or grandmother is a great way to work on their writing. Your child will have to write legibly so that the other person can read it without assistance. Your child also has to be able to group thoughts together. Writing letters is also great way to work on social interaction in a way that takes the pressure off of your child. Since there is no physical interaction, a child can learn concepts like responding to the stories of others, answering questions, and practicing empathy. Learning these skills through letters is a great way to solidify concepts that can then be used later in person. Print some pictures and have your child write a story that includes them all. Have a character jar, action jar, or first line jar that your child can choose from and then include in a story. Have a story notebook that gets passed around the family. Each person contributes a little bit to the story, and then the next person picks up where the last person left off. Read several similar books (ex: the classic story of The 3 Little Pigs, The True Story of the Three Little Pigs, and The Three Little Wolves and the Big Bad Pig). Then either have your child write another version of the story, or use one of the parodies as a template to write a different version of another fairy tale. Most importantly, have fun with it! Have everyone write a story to share with the family one night or have them share it with a friend.